When you neglect to take care of your dental health, the result is usually a cavity. Although it’s not a fun topic, we all get cavities at some point in our life that we have to take care of. Cavities can appear in any tooth of your mouth. However, there are areas in your mouth that are more prone to cavities than others. This is because there are certain factors that make tooth decay possible in these specific areas. Being knowledgeable about these “trouble zones” as a San Francisco patient can help you be vigilant and aware and ultimately help you with your dental health. Dr. Skoulas values her patients and makes sure you are equipped with the knowledge you need to maintain excellent dental health. The teeth that are located near the back of your mouth are the most susceptible to cavities. There’s a pretty obvious reason for this: they are hard to reach when flossing and brushing. So often when we brush our teeth, we are usually in a hurry and don’t thoroughly brush as we should. It’s also a hard area because there are a lot of nooks, and crannies that allow for pieces of food to get stuck in and for bacteria to grow. Over time, if these “cracks” are left untreated with the residue of food, it can lead to tooth decay. That’s why we recommend being very meticulous when brushing and flossing your teeth at all times. If you’ve had a cavity in the past, it’s important to keep note of it for the future. While you may have received dental fillings and have been able to fix the problem, that area of your mouth is still susceptible to tooth decay. Especially if for some reason, your dental filling comes off or a tooth nearby gets a cavity. When you see your San Francisco dentist, they will be able to check your dental records and pay particular attention to these areas and watch for problems. The roots of your teeth can also decay over time. If you see that your gums are receding, this is usually a dangerous sign. This means that plaque can build up closer to the roots of your teeth, which can lead to tooth decay. It’s recommended that you always brush your teeth and your gums gently as well, this is a way to help prevent that build up from happening. 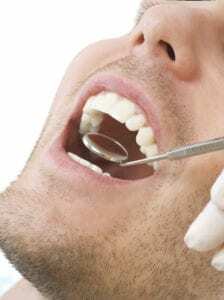 For San Francisco patients, Dr. Skoulas routinely gives dental fillings and is extremely skilled in treating cavities. If you have a cavity, we will gladly fix the problem with dental fillings, and you can leave our comfortable office feeling brand new. Cavities in between teeth are called flossing cavities. These types of cavities occur when food is left in between the teeth for long periods of time. This space in between the teeth creates a food trap and overtime with consistent plaque build up and bacteria, patients are at risk for cavities. Flossing cavities are mainly visible on x-rays since they occur right where the two teeth make contact with one another so they are difficult to see or even notice they are happening. To prevent these cavities we recommend flossing every night and decreasing the amount of carbs or sugars that are eaten. Contact our San Francisco office for Dr. Skoulas and get an appointment scheduled so that we can fix your cavities or other dental problem you have immediately.